It's February already and we have a brand new muse at CASE Study, it's someone really cool, it's the amazingly talented Teri Anderson. I'm always amazed and inspired by her work! 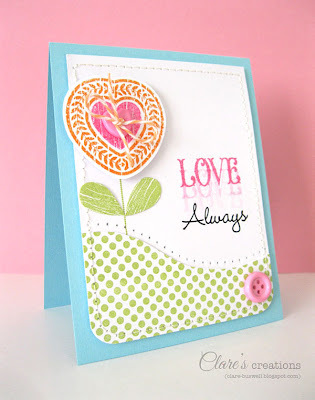 Check out her fab card this week. 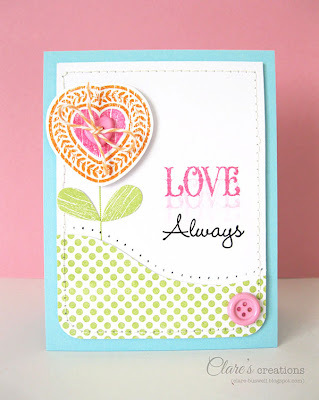 I was inspired by the great color combo (I added some green to my card), the hearts, the dotty pattern and the repeat stamping. So I CASEd these. 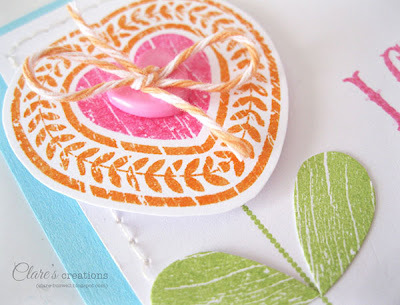 I used the fab My Heart stamp set from Waltzingmouse Stamps to stamp the heart flower. 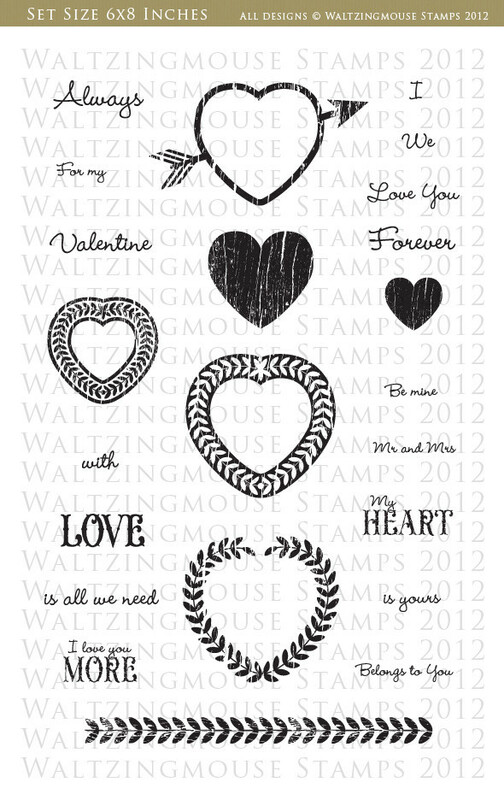 I made the leaves by stamping the smaller woodgrain heart and cutting the leaf shape from it. I used Memento Tangelo, Rose Bud and VersaMagic Tea Leaves on the flower. The Cantaloupe Twine is from SRM Stickers. I stamped the green dotty paper using Off Beat Backgrounds from Waltzingmouse Stamps and VersaMagic Tea Leaves. I paper-pieced the hill and added a little piercing detail. 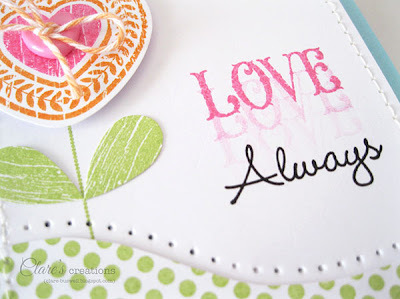 The 'LOVE' sentiment from My Heart I repeat stamped using Memento Rose Bud ink, the 'Always' is from the same set. Ok, don't forget to check out the CASE Study blog to see the rest of the creations from the DT. 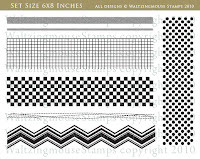 I'll be back really soon with my card for The Craft's Meow Blog hop!! 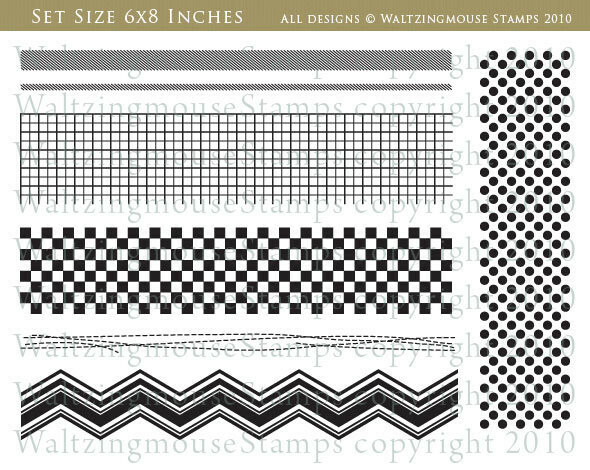 Here are the stamp sets from Waltzingmouse Stamps I used on my card. This is so cute! 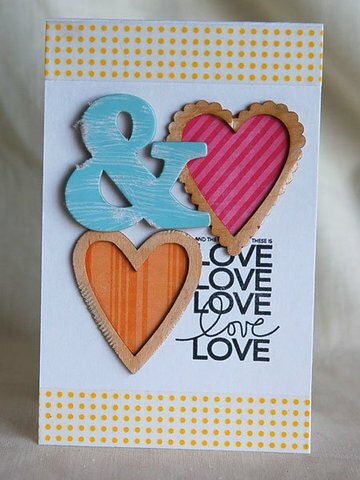 I love the mirrored sentiment! !